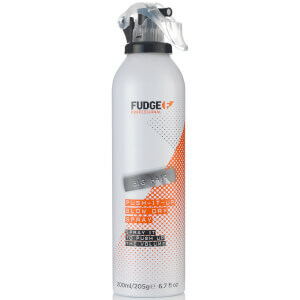 Get the volume you want from your blow dry with Fudge Push It Up Blow Dry Spray. The lightweight non-sticky formula is heat activated, ensuring you get the desired style and a smooth finish when blow drying. Aqua (Water), Panthenol, Sodium Polystyrene Sulfonate, PEG-12 Dimethicone, Phenoxyethanol, Parfum (Fragrance), Trideceth-9, PEG-40 Hydrogenated Castor Oil, AMP-Acrylates Copolymer, Polyurethane-14, Caprylyl Tetrasodium Glutamate Diacetate, Hydrolyzed Keratin, Glycerin, Ethylhexylglycerin, Coumarin, Citric Acid, Bambusa Vulgaris (Bamboo) Shoot Extract, Linalool, Citronellol, Sodium Hydroxide, Ananas Sativus (Pineapple) Fruit Extract, Sorbitol, Sorbic Acid.